Our collection of bestselling floral arrangements is filled with our customers favorites. You can't go wrong with our most popular arrangements and plants. Looking for a sure-fire hit for any occasion? Our customers consistently choose these floral arrangements to delight their loved ones, each one of them hand-delivered by a local florist. You can't go wrong with one of these special deliveries! Of course you want to send the best flowers for the occasion, something that captures the right mood and sends the perfect message. For an anniversary, birthday, or other celebration, bestselling plants and flowers commemorate the milestone. Too many floral arrangements to choose from? A floral arangement is best when it's designed especially for your loved one. 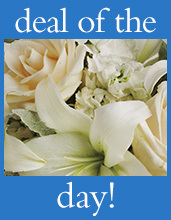 Our Deal of the Day bouquets are designed with your recipient in mind, and you can give custom instructions to the florist creating your order. They'll get the freshest, biggest arrangements available, and you'll get all the credit. It's no wonder that this "deal" quickly became one of our bestselling floral arrangements! We aim to make your shopping experience easier! You can't go wrong with our best-of-the-best!